How To Reuse Your Bridal Lehenga After Your Wedding! A bride’s wedding lehenga is her dream-that-came-true outfit. Every bride-to-be makes sure it’s nothing less than perfect. Be it the perfect colour, the perfect silhouette or the perfect fit and she makes sure she looks phenomenal on her wedding day, just like the way she imagined it since her childhood. What happens after the wedding is done, honeymoon period finished and you are back to your normal life? Your bridal lehenga is safely packed inside a big box or stored in a very safe trunk! Would that be the only time you wear it though? We are sure your super-expensive wedding lehenga is screaming to be worn again and you shouldn't deny it. Can’t think of any other ways to wear it at your cousin’s or friend’s wedding? Well we have got just the thing for you. We have found some really interesting ways to re-invent, re-style and rewear your wedding lehenga! Pair your lehenga skirt with a button-down shirt or a top and revamp it into a perfect party gear. 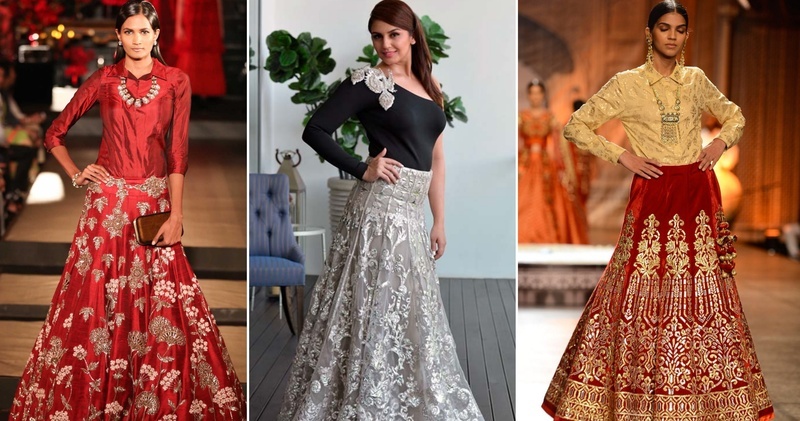 You can also pair your wedding lehenga skirt with an interesting bodice like an off shoulder choli, a crop top, a plunging jacket or something else that will add the much-needed drama to the outfit. How about giving your traditional worked lehenga a fusion blast? Try Indo-western jacket with heavy brocade work over your bridal lehenga and ditch your dupatta completely this time. Just remember the ‘highlight only one rule’ where only your skirt or the kurta can be on the heavier side to not make it look too out there. Also another way of reusing your wedding lehenga is to mix and match totally different outfits to create a vivid contrast. Just make sure not go over-the-top flashy. How about perking up another outfit from your wedding lehenga’s dupatta? Yes, team your dupatta with another apparel be it a different anarkali or lehenga choli and make a regular outfit look more heavy. Most bridal blouses are have a very heavy design, so it’s going to be easy pairing it with separates other than your lehenga. Pair it with different sarees, palazzos or skirts and it'll make for a really interesting ensemble. Anarkalis will never go out of style as they are a classic. You can stitch the blouse/choli of your lehenga with the lehenga skirt and voila, you get a brand new anarkali. All you need is a skilled tailor to do the deed! Also, just imagine the number of times you can wear it! Vidya Vox the singer known for her fusion songs gave an uber cool makeover to her mum’s saree. She revamped it into a stylish, co-ord outfit comprising of a crop top and skirt and the result is purely WOW. Your bridal lehenga will be heavy and voluminous, because it’s meant to be that way. If you plan on using it more often, get a few kalis and the can-can removed from beneath. When the volume of the lehenga reduces, it’ll automatically look more casual and wearable. With these tips we are sure you will be wearing your wedding lehenga more often and not feel bad about it just lying in that treasured chest!